I have an Audi S4 and im swapping K16s on them, this swap has only been done in europe so theres not much support for it and no one makes flanges or anything for it. So I am hoping to replace them with AN fittings, but do not know which to choose. find whatever aluminum drain flange is the closest and cut/weld until it works this is HMT. I just run a pipe npt tap right in the drain hole and stuff a pipe to AN fitting in there, If its a smallish drain I drill it out first. Its probably BSP - british ---- pipe thread - or a straight metric thread. 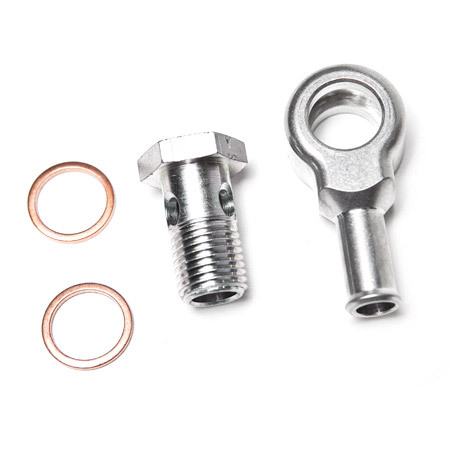 You'll have to find out by trying an NPT first, and judging if the threads are tapered. Or go to Fastenall and have them measure it. For the oil outlet with 3 holes, see if you can find a T3 or T25 flange (whatever is closer), then dremil the 2 holes to fit. Or be baller like me and make your own - 1/8" steel with NPT bung welded on. The only thing left to do is find a way to loop the coolant lines because they are oil cooled turbos only. Is it OK just to block the coolant lines off or is it proper to loop them for flow? i would let the coolant flow. it might be ok to just block it off, but is it really that hard to loop some rubber hose.